Striped walls are like the new thing and I gotta admit I LOVE the look. We have more than few rooms in our new house that are in need of some paint and I figured for the workout room I better go big or go home. I decided on some big horizontal stripes on the wall and I couldn't be more pleased with the way it came out. I measured my wall from floor to ceiling then divided by five since I wanted five even stripes - for my height walls it came out to 22 inches. Starting at the bottom I measured up 22 inches and made a mark. I did this all the way around the four walls marking every few inches. Then I used painters tape and a level to tape a straight line around the entire wall putting the bottom of the piece of tape at the mark. From the piece of tape, I measured up 22 inches again and repeated above steps - only this time I put the top of the piece of tape at the mark. This worked for me since I was only painting every other stripe and leaving the others white. Starting at the bottom, I painted below the stripe then skipped a row and then painted the next. You can use two contrasting colors or you can leave some of your strips white and only paint every other one to cut your painting in half. 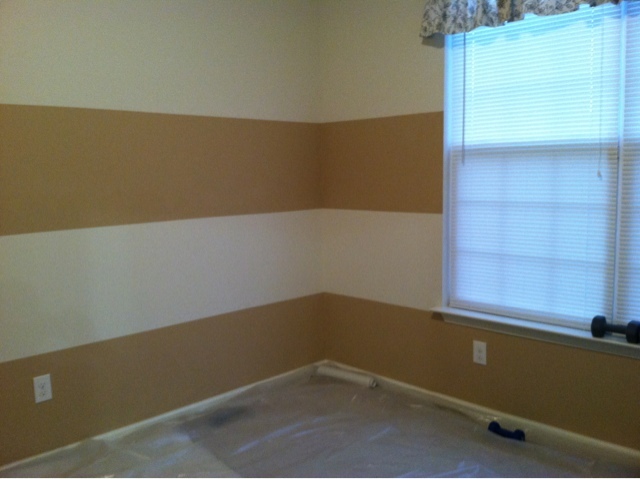 Once the paint was completely dry, I removed the painters tape and wa la I have a striped wall that looks like a pro did it - but no, I'm a DIYer, I did it myself -- and you can, too! Thanks for stopping by 2IY. If you like what you see we'd love for you to share it with the world by pinning it or "liking" it on Facebook!